The editor will not be displayed if the function does not already exist. 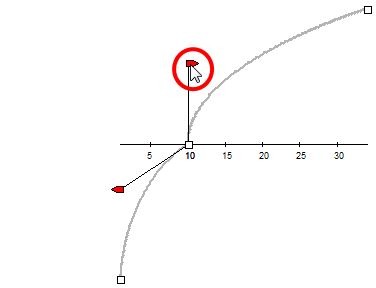 You can reshape the function using the Bézier controls. Drag the handles to modify the shape of the curve. 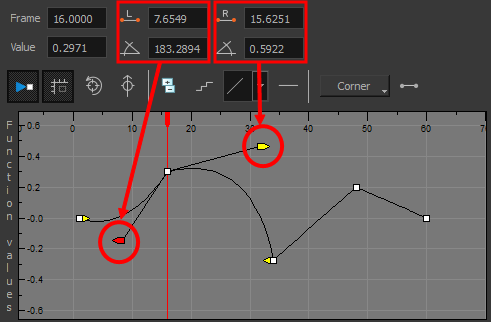 To set the number of frames in the ease-in, press Alt, click to the right of the keyframe and drag the green line. The ease in slope is indicated in blue. 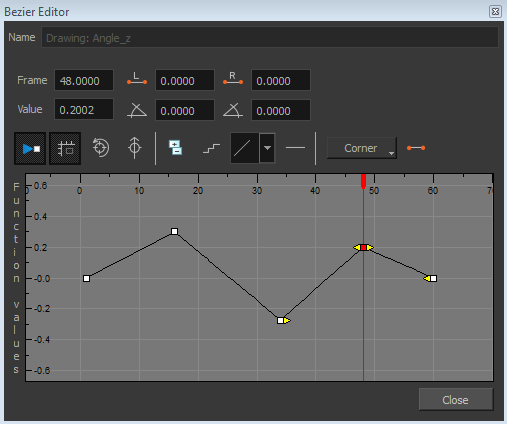 To set the number of frames in the ease-out, press Alt, click to the left of the keyframe and drag the green line. The ease-out slope is indicated in red. To adjust the ease-in or ease-out, drag the handles around the keyframe. ‣ Start: The starting frame for the effect. ‣ Stop: The last frame for the effect. ‣ Step: The number of frames to hold the value. ‣ In the Timeline toolbar, click the Set Ease For Multiple Parameters button. 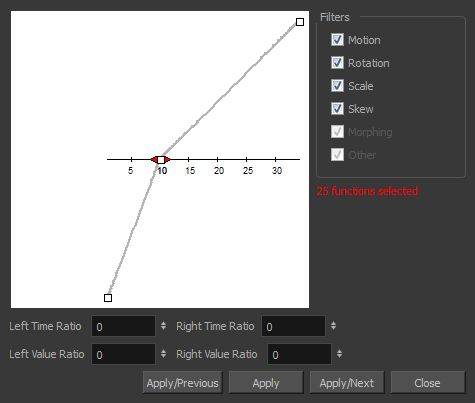 ‣ Motion: Applies the easing parameters to the selected Position X, Position Y, Position Z and 3D Path functions. ‣ Morphing: Applies the easing parameters to the selected Morphing Velocity functions. Note that it applies to the Morphing velocity function found in the Layer Properties window, not the basic morphing ease in the Tool Properties view. ‣ Other: Applies the easing parameters to all the other the selected functions, such as all functions created to animate effect parameters. ‣ In the Left Time Ratio and Right Time Ratio fields, type the percentage value corresponding to the length of time you want the easing to last. Stay between 0% and 100%. If you go beyond 100%, your motion will overshoot. ‣ In the Left Value Ratio and Right Value Ratio fields, type the percentage value of how strong you want the easing out to be. Stay between 0% and 100%. If you go beyond 100%, your motion will overshoot. ‣ Close: Close the dialog box. If you did not apply the modifications, they will be cancelled.